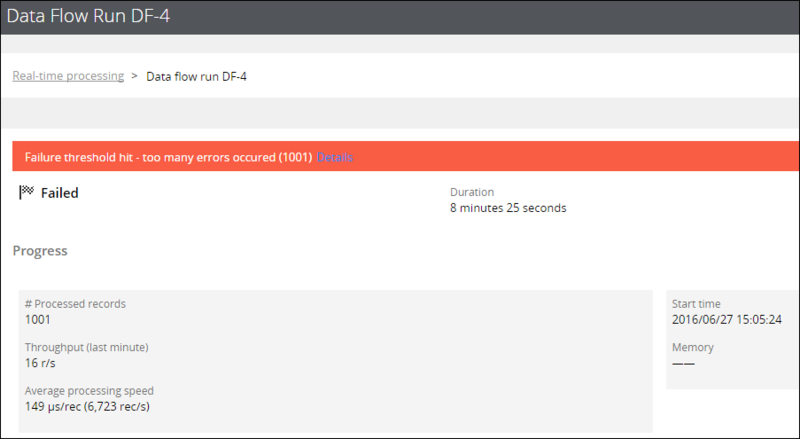 Batch data flow runs always fail on encountering the first error. The number of errors encountered during the data flow run was greater than the threshold that was defined in the dataflow/realtime/failureThreshold Dynamic System Setting. Review the error details, stack traces, and log files to eliminate the root cause of each error. This way, you can ensure that the number of errors during a data flow run does not exceed the threshold limit. For more information, see Tips for troubleshooting data flows. In the Explorer panel of Designer Studio, click Records > SysAdmin > Dynamic System Settings. In the Setting Purpose column, click the Filter icon. In the Search Text box, enter dataflow and click Apply. On the Dynamic System Settings form, increase the threshold limit in the Value field.